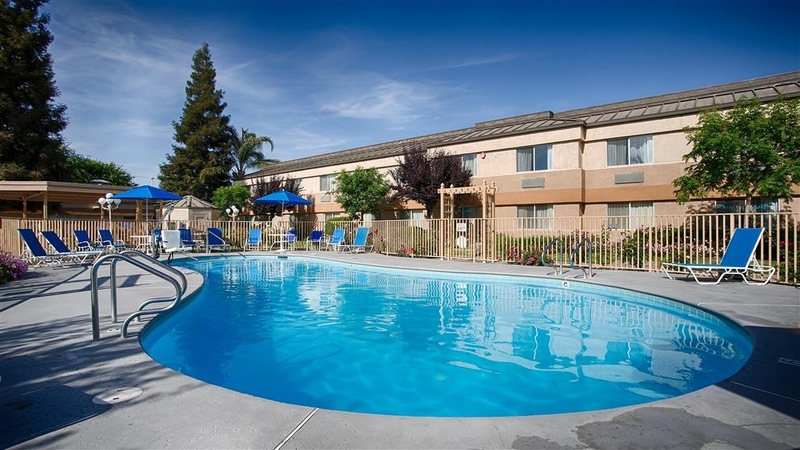 The Best Western Porterville Inn is ideally located in the center of Porterville. Come and experience our hotel near the major tourist attractions. Best price guaranteed and exclusive deals. Welcome to the Best Western Porterville Inn! A warm and inviting staff welcomes you at the Best Western Porterville Inn. Experience small town hospitality and charm where the local scenery and beauty will captivate you and invite your senses to awake with pine trees and fresh country air. The possibilities of adventure and relaxation will draw you in with a short drive to Sequoia National Park and Sequoia National Monument. The Best Western Porterville Inn is located in the heart of Porterville with easy access to everything. We are less than a half mile from Porterville College and Downtown Porterville. The McDermont Field House and Porterville Municipal Airport is just a few minutes away. 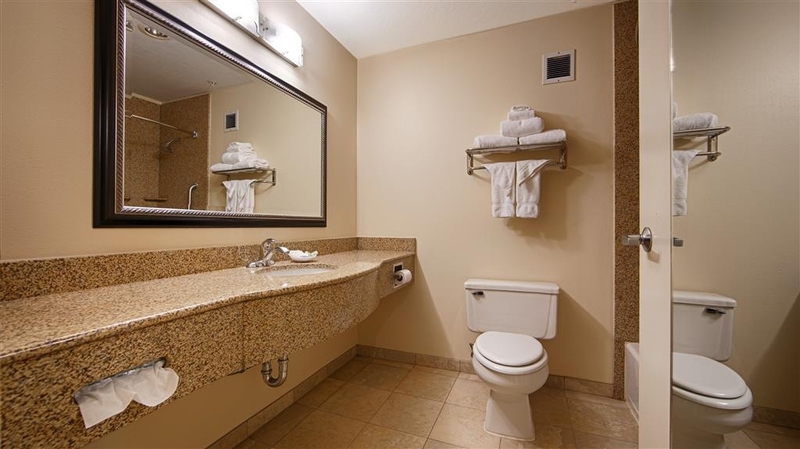 The Best Western Porterville Inn provides both business and leisure travelers a comfortable and pleasant experience. By providing an unsurpassed degree of service, we are dedicated to ensuring our guests the utmost level of comfort. 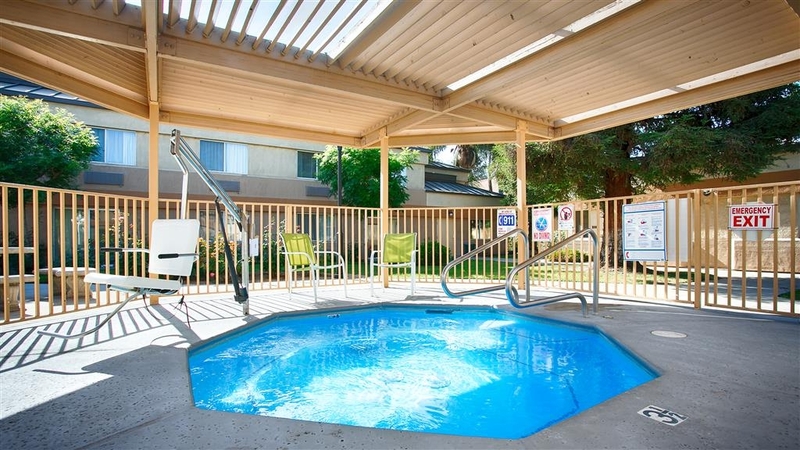 The Best Western Porterville Inn is a quaint hotel with all the comforts of your home away from home. For an intimate setting, guests can enjoy breakfast each morning in the casual ambiance of our breakfast room. The Best Western Porterville Inn offers an extended continental breakfast with an abundant variety of fresh items along with "make your own Belgian waffles. " Guest can also enjoy the 24-hour Denny's Restaurant on site. Guests can relax in our outdoor pool, whirlpool, and sun deck. All of our guest rooms feature full granite showers and vanities, television with pay-per-view movies, extended cable channels, and complimentary wireless high speed Internet access, private voicemail, hair dryer, coffee and tea service, and iron and ironing boards. Our new signature bedding includes triple sheet bedding and pillow tops. Ample parking is always complimentary. Enjoy your stay. From the first experience with this property in booking the reservation I was impressed by the pleasantness exhibited by Sarah who took my reservation. Upon confirming and refining the booking before arrival at no point was I made to feel like the interaction was a distraction from other/more important things and there was an audible smile in the voice over the phone. Upon arrival, we were greeted and give excellent customer service and that excellence was exhibited through the duration of my stay. At the current time, the elevators are being upgraded. Our room and common areas are nice. No Complaints. Breakfast was good. Made yourself waffles are always a good thing to me. Also scrambled eggs, potatoes, and a variety of juices and coffee available. So far so good. Only "point for perfection" is the in-room wifi is a pain. Ended up having to use my phone as a hotspot to get some work done. May simple be my room location. Spring for the extra bucks and stay at the Holiday Inn Express. This Best Western was one of the worst that I've stayed at. I wasn't expecting luxury by any means, but it was an $80 hotel experience AT BEST. The staff was the one saving grace here. Each employee that I encountered was friendly and helpful, which was great. But nothing in the fitness room worked, no thermostat in the room to control the temperature, just red and blue dial. Bed was uncomfortable, water did not get hot enough...no USB charger in the room. The hotel was under rennovation and they were working on the elevator install. The Best Western Porterville Inn is currently undergoing major renovations. The rooms were clean, the beds and pillows very comfortable and all necessary amenities are in the room. The desk clerk, Nancy, was very professional, courteous and ensured that all of our needs were met. Motel recently renovated. Outstanding! Everything from check in to check out was great. The room was clean, breakfast was plentiful, the front desk was kind. We requested extra blankets and pillows and got them without question. "Still under remodel as of 11/14/2018"
First off, there is not much to do in Porterville and I would not call it a destination place. There is Sequoia and Kings Canyon within 45 mins to an hour but due to road work within the park, you cannot get to the "big trees" without waiting in long traffic and we were there during the Paradise fires so everywhere was smoke and ash. Secondly, we were charged the FULL room price regardless of the construction and trash everywhere. Seems like they could have cut the nightly fee considering the ongoing construction across the street from the hotel on the new Aldi Market and the remodeling still occurring inside the hotel! The construction crew working on the Aldi store, stays at the Best Western and although they were very polite, they do rise at 5AM and their constant slamming of doors with accompanying hallway noise all makes for an early wake up. It seems the rooms next to ours were used as staging areas for the interior/exterior remodel of the hotel which caused daytime noise and distractions. My husband was in Porterville for a business meeting. I tagged along and worked inside the room remotely for my job but the constant pounding was annoying and prevented me from making any work calls. The main thing I HATE about booking with any Best Western is they use a 3rd party. You have to pay close attention when booking online because if you click on the Best Western website (or what you think is their site) it defaults to a 3rd party who could give a sh*t about you or your travel plans. As it was, I booked the room and needed to change the reservation, a day after booking, to 1 day later arrival and 1 day longer stay. I called and was directed to the 3rd party who told me "your chance to change or cancel expired 10/14/18" I had not BOOKED until 11/7/18 so basically my chance to change or cancel was PRIOR to even booking the room!! Beware. I had to call the manager and change the dates, but he was not happy about it. When we arrived, we were told the pet fee was $50 per night=$100 but to that they added sales tax. The room charge was supposed to be $112.00. Discover card sent me an alert advising we were charged $108.00 for the pet fee and $351.50 for 2 nights at a Best Western! So....$175, plus $50 pet fee for 2 nights at a Best Western? I called the Front Desk and was told they would "go over the charges and call me back". I never received a call but I did manage to get the charges resolved. Not very happy and don't plan to return to Porterville anytime soon. Thank you for your review, we are taking steps to make changes in order to make a guest stay more satisfying. These concerns will help us focus on the right areas. Had a nice, clean and quiet room with a Denny's restaurant next door. I would recommend to anyone for value, price. There was also shopping and a Galaxy 9 movie theater nearby for short driving distance, as well as scenic mountains and roads for access to view. Clean, comfortable room. Good Wi-Fi. Free Breakfast is pretty decent. The Hotel is under construction and this worried me a little but all was good. What has been completed is nice.I would stay again if in the area. My room was fairly clean.. Apart from the EXTENSIVE mold damage in the shower. It was enough to leave me in respiratory distress. (I am a mold remediator by trade.) Advertising spa/hot tub, but it was not functioning. Neither was the Wi-Fi. Disappointing stay for $130. Thank you for your review. The mold issue has been taken care of right away. We are ordering parts for the Spa/Pool pumps. As for the Wi-Fi, we have not had any problems or complaints from guests and we have check it for proper operations. Be advised that this location is undergoing extensive renovation, with numerous problems (hopefully temporary) for visitors. I have been very pleased with this hotel in the past, and hope that current problems can be resolved once construction is complete. I find it irresponsible that Best Western did not provide a notification that this property was undergoing renovation. On the bright side, service was excellent. Thank you for your review, we are getting to the end of our renovation. Currently exterior work is in progress. All guest room work is completed. Everything was as expected; nice accomodating receptionist, clean rooms, relatively quiet surroundings. So, no complaints there. However, not sure what the source was, but the entire 1st floor smelt of paint or some solvent. Maybe it was because of the construction in the front entry. We have stayed here on many occasions for many years while preforming work in the area which has limited lodging options. We always reserve multiple rooms, usually for months at a time, and we always seem to have an issue with additional charges being added to our bill. Only after questioning charges do we find out that they are for towels being soiled or things apparently going missing that haven't been touched let alone removed from the room. The staff at this location is helpful and accommodating, but the owner forces them to charge additional fees unknown to the guests. The owner is very augmentative and rude when you have to deal with him. It's unfortunate that this is a representation of the Best Western name. Thank you for your review. We do take steps to try keep our cost down for all the linen that gets damanged on a daily basis. If the towels were use to wipe oneself after washing then only normal wear would take place. But we encounter many damaged towels that looked like they were used to clean tools or shoes. We use these fines as an attempt to discourage the heavy damages that occur on these items. Extremely disappointing. I asked at time of reservation if there would be construction and was told no - the entire place is being "renovated" and was a shambles. I tried three separate rooms downstairs and was able to open the "locked" window in every one, finally asked for a room upstairs. Finally, no internet at all the entire stay. My advice is to stay at the hotel next door. I will never come back. Thank you for your review, Although our hotel is going through renovation it is nearly completed. We inform all guests that make reservations with us about our construction. Our wifi was down for parts, it is now repaired and now working. "Great Stop for Last Minute Travel Plans"
My grandmother and I were visiting a family friend that was ill in the hospital in Visalia and we brought our small dog with us because we planned to spend the night at a relative's house. Long story short, we were unable to stay at said relatives house and needed to find a pet friendly hotel. Unfortunately, the wildfires burning meant that many hotels were filled in with emergency service workers around Visalia. So we ended up in Porterville. The staff was great and the rooms were more spacious than I had anticipated. Vreat selection of breakfast as well including omelets, scrambled eggs waffles ect. In spite of on going construction, this was a great experience. If you stay in Porterville, this is the place to stay. The breakfast was great and the staff helpful. If the corporate web site says they are full, call the hotel directly. I have stayed here before and had a great stay but this time was a little different. The staff is great and the room was fine but evidentially there was a couple of pot growers staying a few doors down from my room. It smelled like a combination of skunk and pot. There was construction going on and even though the workers aren't suppose to start making noise before 7am, it started closer to 6:30. I do understand since the days were around 109 degrees so they wanted to beat the heat. The maid also left the used pillowcases in the room. Usually this Best Western is great to come to and spend a few days. I will certainly be back. This property is very overpriced! It is not in a premium location and is in terrible disrepair. It has been under construction for a very long time. When I mention this to the front desk person, I am always met with “the owner has a hard time finding good help, he's always firing the construction guys”. Hmmm, that's telling of the kind of person the owner is! There is virtually NO security, the outside doors are never locked. The hallways are not accessible from the lobby, the hallways are in need of paint and wall repair. The rooms are not the cleanest and this visit we awoke to no hot water, terribly inconvenient since we had a wedding to go to. I have endured this place as much as I can, going next door to the Holiday Inn Express from now on. Thank you for your feedback. It is taking longer to get this renovation done. We will look for ways to get it moving faster. "My home away from home :-)"
this was the lowest quality BW I have ever stayed at. The bed was too soft, the pillows too small and way too soft and the air conditioner took forever to get the room cool and it struggled to keep it cool. "This hotel was as good as a Best Western Plus"
Staff was helpful and courteous. Decor, amenities and service were as good as a Best Western Plus. Bed was comfortable, breakfast was the standard Best Western hot breakfast. Our room was at the far end of the corridor and WiFi was weak. "My stay while in Porterville"
They were remodeling the hotel, however I did not experience any noise or problem during my stay. I really like the remodeled room I stayed in. The staff was very helpful and professional. I would stay here again if in the area. Not a great experience. ?? plyboard in the lobby and the hallways. I was able to hear every car and person in the parking lot. The bed was not comfortable. The bathroom was very clean and the staff was nice. Thank you for your review. We apologize that our renovation construction is affecting your stay. When the renovation is completely done, this hotel will be a much better place to stay. When its done we look forward for your return visit. The Hotel was amazing nice staff, facility. They had a great breakfast choice my daughters enjoyed it. Not complaints. I highly recommend.We were right by the pool and my family enjoyed all around. Family friendly. "Best Western Porterville Inn, nice location"
Best Western Porterville Inn, nice location and less than an hour from the Sequoia National Park entrance. Restaurants at walking distance. The Hotel was under a remodeling process, even though it was not noisy. Nice breakfast. "Great hotel, spacious and clean room, excellent breakfast!" Called here at 10pm when my previously booked hotel was terrible. The girl working the front desk was incredibly nice. Gave me a room at the AAA rate with late notice, gave me a room close to the breakfast room so I wouldn't have to walk far in the morning. The room was very clean! Great TV, plenty of coffee and hot chocolate in the room. The bed was very comfortable, best sleep I had the whole trip. Very quiet, never heard other guests from my room. Bathroom was clean and had a nice shower. Loved it! Very noisy hotel. Guests that were probably local workers were extremely noisy until late a night and seemed to leave their rooms at 5am letting their doors slam, yelling in the hallways, talking loud. Hotel walls are thin as it seems to be an older hotel. AC unit sounded like a jet engine when it came on so I could only use fan throughout the night. Thank you for your review. Yes we do have workers staying at our hotel and we have informed their company of the noise their workers are causing. The company will it for action. Not worth $116 per night of stay. Carpets looks uncleaned. The beds aren't that comfortable. Our bed sheets weren't changed unless you requested it. Towels weren't replaced either. Very small room. Breakfast were the same during the entire stay - potatoes, eggs, and sausage. Holiday Inn is far better that this hotel. Thank you for your review. During your stay of 11 days, we did not get notices of any concerns that you encountered. At check out you informed our Front Office Manager that you had a wonderful stay. We always want to know these concerns while you are staying. This way we have an opportunity to correct these items. My husband and I stayed here when I attended my 40th High School class reunion. We had a great stay and all the staff were very friendly and helpful. The room was clean with nice decor, the bed was comfortable and the free breakfast choices included waffles, eggs, sausage, potatoes, cereal, yogurt, coffee and juice. This was also one of the few hotels in town that allowed a dog to stay (for a pet fee). We will definitely stay here again! I stayed here on a business trip, and was underwhelmed by the hotel. On the plus side, it's quiet, affordable, and conveniently located. The free Wi-Fi is a plus. On the negative side, it's desperately in need of a facelift. There are no elevators, so you need to lug your bags up to the second floor. The carpets are old and stained, and the pillows are not particularly comfortable. The free breakfast was barely edible, and the service was lackadaisical. One day I didn't even get housekeeping for my room, even after requesting it from the front desk. I wouldn't stay here again if I had a choice. Had to stay here again since there are few options in P'Ville. Easy check in. We got a decent price on hotwire. Extra fee ($10) at check in for a second bed. Parking lot was pretty empty at 9 pm. Bed was a bit soft for my taste, shower hot, in room fridge, microwave, coffee-maker. TV was solid and well-placed. Comfortable room. Bathroom was large, but had no fan. Quiet hallway. Pool looked decent. There was construction debris on the north end of parking area. Daytime noise started around 8:30 am. Breakfast buffet was better than expected - eggs, potatoes, sausage patties, with belgian waffles, cereals, good bread and juice choices. No need to go anyplace for breakfast. Looks like they are adding an elevator near breakfast area and reconfiguring access from lobby. Room carpet badly stained and could use replacement, or at least professional cleaning. All in all, a good stay. "Good, quiet, well located business hotel.."
Quiet location, clean room with nearby food options and good breakfast, internet and shower, and television options; excellent for business trips and willing to give government rate and allow check in of my research crew before I arrived. We were on our way to sequoia national park & this was a good stop for us. Hotel is being renovated, but this didn't pose any inconvenience for us. We had 2 rooms, both spacious & both with a dorm size fridge. Room was very clean , bed was firm but comfortable, air conditioner worked great & it was over the Labor Day weekend heat wave. Breakfast had a lot of choices & was at the end of the hall from us. And also important the price was reasonable. This is another best western that I stay at...And a great place. Good location very quiet great staff very helpful. you can't go wrong. Price is very good, beds you can sleep in and get a good nites rest. We had a wedding anniversary and needed a place to stay. This was the first time staying at Best Western inspite of the remodel going on, this hotel was clean. I liked that the pool was surrounded by all of the hotel. My children loved the pool. We all enjoyed the breakfast we will definitely be back. This hotel was fine but nothing special. I would have probably given it 4 stars except the front desk wasn't very prepared. I went down for change for the laundry (which they advertise as having) but they only had $1.50 worth of quarters which isn't nearly enough. Then we needed extra towels and they didn't have any of those available either. However, the room was nice and clean and the location was good. They had a sewer pipe burst earlier in the day (not something they could control) and they were doing a great job of containing the construction mess. That really didn't affect us at all except having to walk a bit further to get to the lobby from our room. We didn't have a chance to swim but the pool and hot tub looked nice and well-maintained. It was quiet, which is always a great quality in a hotel. I would stay there again. The room was infested with 100's of ants that were on everything by the time I woke up the first morning! Moved to a different room, but peace of mind was shattered, especially after the hotel staff moved my belongings on their own. I told them I would move them and that they were out of the way, but when I went into the room, they were gone. It's not like they could put another person in the room (I hope). Thank you for your feedback. I am sorry to hear about the ants in your room. We have treated the room and will recheck it again. We will continue to recheck periodically to ensure not more ants. "Time to retrain the front desk staff!" Since there was a major reconstruction project going on during our stay, something we were not warned about when we made the reservation, the place was a huge, loud mess. All the usual ways of getting around the property were blocked and the front desk staff would just say, "Just go out and around" and expect us to figure it out. Very poor customer service since it was 100 degrees outside and wandering around was very unpleasant in business attire. Also, several members of our group, myself included, had trouble with the magnetic strips on our door cards. The staff acted like we were idiots who didn't know how to use a key card. We always had to wait for coffee at the breakfast buffet and half the toaster was broken. Toast and coffee! How hard is that? Very off-putting. These were just some of the problems we had which could have been easily smoothed over with some basic customer service. Next time, I'll stay at the Holiday Inn next door. Thank you for your feedback. I am sorry to hear that your stay at the hotel was not satisfied. This information has been passed on to our concerned staff for training on good and bad services. "Ant invasion gets you 10% off one night." I've stayed at this hotel MANY times when visiting my girlfriend's family in Porterville, CA. This time we brought my two daughters so I got two rooms adjoining. After the first night, my girls woke up to ants all over their end table as well as on their beds. Not a couple ants, an infestation. They were on the floor as well as their computer backpack inside and out. My youngest even had some in her bed with her. Ultimately, we were relocated after first being told they were going to clean that room thoroughly. I ended up moving all our stuff to the second floor with the help of the one really great girl who works the front desk. Moving two rooms when it's 108 outside isn't what I had wanted to be doing during this trip, but it was necessary. I informed the front desk lady, Minni, that I wanted a call from the manager or owner before the end of my stay and I wanted to be informed on what change would be made to our rate. We were there for 4 nights, two rooms. Mind you, the money is the least of my concerns. This is about doing what's right. I'm in the customer service business and know the importance of taking care of customers. I never got a call back. So, I called on my drive back to LA and asked the manager on duty what was being done to our bill. He informed me that the owner said they would be taking 10% off the first night of one room. I was blown away. And I admit, the manager was on the receiving end of some sarcasm. I asked him to repeat it again to me... and to tell me that 'Here at the Best Western In Porterville, if your kids wake up with ants all over their stuff as well as on their bodies in bed, we are happy to offer you a 10% discount on one night." I told him the obvious thing to do here would be to fully comp one night on one room. That's one out of the 8 charged nights. That wouldn't be what I would do, if I ran the place, but it should be the minimum. I asked him to have the owner call me within an hour and tell me himself of the decision. The owner did call back and informed me that actually he'd be doing nothing, as we were moved to different rooms. This is among the worst failures of common sense I've ever experienced. And again, money is the least of my concern. Heck, I'd give anything that came off my bill, to the charity of Best Western's choice. Money is not what concerns me here. It's pure incompetence. I've contacted corporate and look forward to their thoughts/position on this. Thank you for your feedback. I am very sorry that your room at the hotel had ants. We are working to eradicate this pest. We know how these pests are a big nuisance and we will continue to make every effort until the ants are gone. The room was clean and the breakfast good. The bed was comfortable, but they could use some new pillows. My room key worked for my room, but not for the exterior doors, which was very inconvenient after using the pool. Also, bring your own beach towel; their pool towels are the size of dish towels. All in all a good deal, and much cheaper than the Holiday Inn Express. I am glad to hear that you enjoyed your stay with us. Because of the construction we have had many challenges to maintain normalcy for our guests but we continue with our efforts. Construction was ongoing and started promptly at 6:30 am. There were guests with dogs who were in the hallway with loud music playing from their rooms with their doors open. The tile floor was wet and extremely slippery. Not a good experience at all. Thank you for your feedback. I am very sorry that your stay was not satisfactory. Yes we do have a renovation construction going on. As best we try to keep the construction project from interfering with the guest stay some things do not go as plan. Once again I apology for this inconveninces. Currently, there is some construction involving the addition of elevators. It is only a two story building. The rooms are nicely kept. The breakfast room was large and clean. The staff is friendly. The pool area is very pleasant. There is a Denny's next door so a person could just walk from the BW. "Pool out of order and property under construction"
No one let us know that the pool was out of order or that so much construction was going on. I promised the family we would have a pool and not even given warning (maybe via e-mail) that it was out of order in a town that the temperature is in the 100s. Would have been nice to know so we could make other arrangements. Property and room clean but carpets dirty. Thank you for taking the time for providing feedback on your recent stay. We have encountered a number of problems with the pool system including waiting for parts. But finally the pool and spa are up and running. Disappointed my door would never open to let me in and that I want notified of the pool closure and construction, but was delighted with my room and amenities. Additionally, the complimentary breakfast was wonderful. I was able to keep room at a comfortable temperature for sleeping which is very important to me. The room was clean and nice and roomy too. The hotel is pet friendly which is important to me. The internet is awesome. "This place could benefit from more staff"
We booked this place because it was near the Sequoia National Park...well "near" being about an hour away. All closer hotels were mostly booked for our family of 5 (3 adults and two kids). We wanted a place with a pool. The pool is nice, but there is limited seating with umbrellas (and it's hot even in May, 95 as I write this). The rooms are ok...nothing to complain about. Beds were pretty comfortable. The included breakfast was hearty...omelets, sausage, cereal, muffins...a nice spread. We ran into a few frustrations. First, our keys had continuous problems. Had to exchange several times and we were not alone...got to meet more people I guess :-). In the second day (we stayed for 2 nights and 3 days), they ran out if pool towels. Then ALL towels. We stayed on a weekend. In the morning after our first night, we had the Do Not Disturb sign on until about 10:30 or 11. We got back from breakfast, took the sign down then went out for the day. We returned at 9 at night and our room had not been serviced. Not usually a problem for us...except for the towel issue. In the second morning the breakfast room was fairly full, and most of the food and coffee was gone. The woman working there was not in the room...she was making more food. My sense was that she was working pretty much alone. I got the sense that they had a very small staff. In my experience they were understaffed. Everyone who worked here was nice, helpful, and seemed genuinely upset when, for example, there were no towels. That tells me that this place needs more staff of the same quality that they have. When you short your staff, your short your guests. "Rode Trip with friends- Motorcycle"
Was on a 3500 mile motorcycle trip with friends, and stayed at several BW's on the way. This property was very nice and conveniently located. Was able to get room on ground floor and park bike right outside close to room. There was a Denny's right next door to walk to. All amenities were great, and provide a great breakfast as well. Would stay here and recommend to my friends. Thank you for your comments and for choosing our hotel. We are happy that you enjoyed your stay. We will look forward to having you again. Stayed at many a Best Western. These folk need to go to Modesto CA or Williams AZ and learn how to run a hotel. It was dingy, unkempt and the breakfast poor. Luckily I will never be back but you need to improve. We appreciate you taking the time to provide us with detailed feedback about your stay. I am sorry to hear that several things throughout your stay did not meet your expectations. Please note that your concerns will be worked on to correct any deficiencies. Room was very spacious and clean. We enjoyed our stay and having a couch was nice also. Only negative thing I would say is that it didn't have a vending machine with snacks. Or if it did I did not see it. I am glad to hear that you enjoyed your stay with us and that you found our rooms very satisfying. We hope to welcome you back to the hotel in the near future. For a small town, this hotel exceeded our expectations in quality and comfort. The price was quite competitive. The staff - desk and room - were all very professional and friendly. I booked online and found it very easy, and checking in was expedited. For tired travelers, this was a plus! Thank you for taking the time to review your stay with us. I am very pleased to hear that our staff made your stay pleasant. Looking forward to seeing you again soon. Thank you for taking the time to review our property. I am glad to hear that your stay with us was a memorable one, despite your loss. We look forward to welcoming you back to the hotel in the near future. "Stay at the Holiday Inn"
Cheaper here but don't care about guests.. No elevator, serve 1/2 portions at breakfast, always run out of yogurt.Takes a week to get something fixed. Rooms full of ants.Refrigerator does not stay cold.Microwaves are old. Thank you for your feedback. All your comments are important for us so that we may use to educate our staff about good and bad service. Your feedback will be used for training. We will address these issues. I apologize on your concern. It was not my intention to disrupt your stay. Your room was not listed as occupied so I needed to find out who was staying in the room. Again, I apologize on your inconvenience. I have a group of friends that stay at this same hotel two times per year for a camping trip. Some of the older friends or those with health problems stay at the hotel. We love it here and have never had problems. I appreciate your positive feedback about our hotel. I'm happy that you enjoyed your stay and I'm looking forward to having you back again as a guest. Jay who checked us in, still had a smile on his face at 1:00am and managed to crack a couple jokes. Funny guy , we asked for down stairs so we could keep a eye on our work truck. Give us our wifi codes and explained breakfast in the morning. Thank you for your comments. Our front desk agent do go out of their way to help our guests. We look forward for your return. Ray or Jay, at the front desk was very rude and impolite, doubting that I was a Diamond member. I have been staying at Best western locations all over the USA, and I have never experienced that kind of service before. But there is a lovely lady by the name of Kristine I think, she was able to solve a issue i had right away. "Last minute stay for a funeral"
I stayed at this property on February 17th for one night. Very clean rooms and gracious staff. 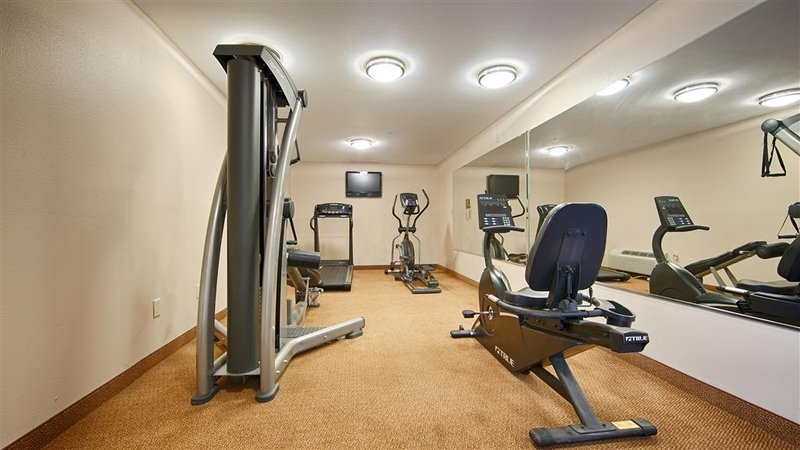 Don't be fooled by the dated exterior - the rooms are very clean and well maintained! The breakfast was great and many choices. I would stay here again. "Great Quality for the Price..."
Upon your arrival, you will be greeted by a friendly & knowledgeable staff. The hotel has all the amenities you should need. Located just off the highway with easy on & off access. Except for fast food nearby, there are no sit down restaurants in the immediate area, it will take you a short 5-10 minute drive into town for a sit down meal. Plenty of Mexican Taqueria's with excellent food... Plenty of parking for all sized vehicles. will always choose Best Western as my hotel! The rooms are clean and the staff is very hospital. The complimentary breakfast is a good way to start the morning! I used the laundry room at my last stay and was very happy with the results. "A good place to stay for a night!" I've stayed at many Best Westerns as I travel frequently on business and also for pleasure. This Best Western was typical of many that I've stayed at. The room was clean, the hotel was reasonably quiet and I had a good night's stay. The breakfast room opened a couple minutes late, not a big deal but I was on a tight schedule that day. I would stay here again. "Reasonable Price for Good Service"
This Best Western found me a room right away even though my reservation was to begin the following day. The staff is always courteous and helpful and attend my needs in a timely manner. Check In and Check Out is quick and easy. This time my wife left clothes and when I returned home a voicemail informed me of this situation and we were able to arrange for return of the items. I look forward to return in November when I visit friends in Porterville and highly suggest others stay at this Best Western. A/C was very loud in room! Couldn't sleep. Spa/whirlpool heater didn't work. An employee told us it had been out for at least a year. We stay at a hotel/motel that has at least a 3 star rating mainly for the whirlpool/spa, which we like after a long drive. This motel was miserable. We stayed only one night, and it was fine. Not exceptional, but not bad. Check in was efficient, not friendly. Housekeeping staff congregated everywhere, but since we stayed only one night, I have no idea if it affected the room cleaning. Breakfast was typical BW quality and variety, except that they did not carry cream cheese. We booked a room for our family vacation and exploration. We specifically chose to pay during check in at the hotel. After a tiring and long day during in the winding road at sequoia national park, we were ready to end the day and just rest only to find out that our reservation was cancelled without us being contacted. I have 2kids who are tired and hungry. I just can't believe it. This is my first negative review here. I'm just really disappointed. Check in was easy and the hotel staff very helpful and friendly. The hotel itself can use a little paint to touch up the walls. Not a place I would choose to stay but there were no other rooms available at any of the other hotels nearby. It's worth the low price you pay if that's what your looking for. Otherwise comfortable, clean and quiet. About a 15 minute drive to the Sequoia forest entrance. Free breakfast. The front desk was very rude and made me wait around while he had a personal conversation with another employee. I also stood around while he stapled papers and answered phone calls. Break fast staff was rude and told me to eat with my fingers because they were out of plastic spoons. "double check your reservations and bill"
For the money value, this hotel is great. The proximity to Sequioa and Kings Canyon National Parks is the main attraction. There are plenty of places to eat nearby. But, seriously, confirm and double check your reservation before arrival. The staffs were somewhat easily confused. We were doing a road trip through America and we were on a tight budget. This Hotel was great value for money and we really enjoyed our stay there, if you have the chance to stay here we highly recommend them. We only had one issue with the hotel and that was the access card to the room needed to be reset, due to me putting it next to my phone. "Last minute one-nighter, completely satisfied"
Booked this hotel at midnight after the Fairfield Inn Visalia Tulare kicked out our reservation for no good reason. The front desk lady gave us AAA rate out of kindness, though she could have charged us anything. The room itself (2 queen) was large and clean, and fulfilled all our needs. As a family of four this is not always a given. Example: I counted at least 8 electrical sockets for our use, including in the bed lamp and in the front of the microwave, nice touch as we had many electronic devices desperate to be charged. The breakfast far exceeded our expectations, with eggs, sausage, toast, muffins etc, yogurt, cereal, juice, coffee and tea and even instant oatmeal. The only caveat was that all 8 tables in the breakfast room were taken and we had to wait a few minutes. Adding a couple of extra tables outside the room could solve this. Overall, wish we had booked this one in advance and saved us the hassle. Unfortunately, this BW property did not live up to the comfort, good quality and value that I expect from BW. The carpets in the rooms were very dirty. The AC was not efficient. The pool light was out and surrounding area was not safely lit. The beds were also uncomfortable. Although the staff was friendly and the breakfast was pretty good, I will not being staying at this property again. It desperately needs UPDATING! The staff are great but the hotel needs to be updated and the rooms are dingy and old looking. Hint of smoke in the room. The breakfast was nice to have but it was not like other hotels offer. The couch seat had a blood stain and was flipped over so we could not see until we used the sofa bed. Did not like my child sleeping on it. "Needed a room after release from hospital"
Everything was extremely satisfactory and appreciated on a short notice from the release from the hospital - a room was available and the check in was smooth. Daniel the clerk, offered to know if I had AAA so he could apply the discount which was very much appreciated on this emergency stay. This Best Western has consistently provided a safe, quality stay on our trips to California for business or in transit to Vegas to visit daughter and grandkids. I would reccommend this motel highly. this stay, I utilized the guest laundry which was reasonably priced. Staff have always been couteous and helpful. We especially like the hot breakfast which compared to other chains has a greater number of choices. "Nice stay for our trip to Sequoia"
We recently visited Sequoia National Park and stayed at this hotel for one of the nights of our vacation. It was clean and well taken care of. The hotel staff did a good job and the free breakfast was pretty good too. I'd recommend this to others passing through. Very clean. Staff was great. It was one of the nicer hotels in town. I would for sure stay at this hotel again. Right next to several different restaurants, and it was very quiet. Price was also pretty good for the value and has a great pool which comes in handy with this California heat. "good hotel - great bf, quiet & convenient"
Nicely located, was 2 night stay for us visiting Sequoia NP. not far from park and town have all you may need to offer. gr8 break fast, never run out of anything which I liked most. small room but was sufficient for us. The room was very nice. It was clean, well furnished and quiet. We had a nice view of the pool from the second floor. The staff was very friendly and helpful. Breakfast was very good. We had cheese omelettes, sausages, muffins, yogurt, fresh fruit, coffee and juice. They also had waffles. The hotel is conveniently located and away from traffic congestion. The price for the room was very reasonable. It was much cheaper than the Holiday Inn Express next door. This is probably because it is a much older hotel and not in "perfect shape." It was good enough for us, though. We would stay here again. "everything was presentable as we got in"
"Porterville Best Western is AWESOME"
Were worried that we didn't book the hotel next door (holiday inn??) But when I checked in with the guy at the hotel he was so friendly and cheerful that I felt better...then we went down the hall and it honestly reminded me of a nicer Bates hotel, then we got to our room and the furniture was new and very nice, everything was clean, and the bed and pillows were super comfy! I used to work as a consultant for paint colors so the fact that there was no color bothered me but not my husband. Ha! The room just lacked warmth. If you need any help let me know! The shower had mold growing in it, the baseboards were filthy, the light switch was filthy. The key cards did not work. The hairdryer plug kept coming lose. Only one bar soap to share between the sink and the shower. The toilet seat was up when I checked in. Although the hotel was not sold out, my room was next to an exterior door that kept slamming, and the noisiest ice maker. "Not a bad stay at all"
Everything about this stay was great. The gal at check in was nice and a pleasure to talk to and was genuinely interested in why we were visiting, the room was clean, the breakfast was great, not as much noise as other reviews stated. The only thing that we didn't enjoy was the bed, it was not super comfortable otherwise it was great. The cleanliness of the room was disappointing. There was a large wet looking spot on the bench, debris on the floor and chairs, and other people's hair all over the 2 chairs in the room. The exterior doors to the hotel, while having card readers, were not locked, you did not need a card to enter any of the doors to the building. Being that there was police activity involving an attempted stabbing on site the evening of our stay, which resulted in people being removed from the property in handcuffs, security would need to be improved before I would recommend this particular motel to anyone staying in the area. It was just scary and gross. The staff was friendly and understanding, and I'm sure that they are doing their best with what they have to work with, but they should be given additional training in quality control and also the funds to repair items that need to be addressed, with the security issue being top priority. Housekeeping should be retrained with basic skills needed to detail clean & sanitize rooms after they are vacated. Again, I understand it is Porterville, but it's also a Best Western and this motel reflects negatively on the Best Western brand. "Needed a reliable convenient and mid priced place to stay"
I have stayed at this Best Western many time. It is conveniently located. Quiet, but right off a main street in Porterville. There is even a Denny's at the back that you can walk to from your room (and now they even deliver!). I debated whether to stay at the newer Holiday Inn next door -- but it was $25 more dollars per night. So I didn't. The hotel does suffer from age. The rooms are clean but stuffy and worn. And the air conditioning (which we needed -- due to the stuffiness) kept us both up at night (rattling and churning). Breakfast quality was far below other Best Westerns we have stayed at -- so we at at the Denny's behind the hotel. That said, the staff was incredibly friendly and helpful. Had one of the most comfortable stays at this hotel. Definitely worth the rate. Great breakfast and staff that went above and beyond for allowing me to keep my reservation despite some fraudulent activity that basically rendered my credit card useless! Definitely recommend. "Best Western, Porterville CA is OUTSTANDING!!" The Staff at the Best Western, Porterville, CA, make this Inn an enjoyable stay every time I have business in Central CA. Their individual and collective professionalism and friendliness plus the great rooms and amenities make this Hotel simply outstanding. Nice stay. Close to the Eagle Mountain Casino. Staff was very helpful and welcoming. Pool area in the center was so much more private than many hotels that expose you to the public. Nice clean breakfast room. "Don't plan on staff being helpful"
Just not the quality I normally get from a Best Western. I am very disappointed. For 5 years I have stayed here to Teach Wildland Fire Classes. The Hot tub & pool are always down for repair. Manager is a nice lady but the staff leaves a lot to be desired. Could not get Swing shift lady to replace tv remote batteries. She walked to our room and was RUDE...Talked to me like I was a child. I may never stay there again. I might have to check next door at the Holiday next year. I recently stayed at this hotel for a few nights for a business trip. It was one of the better Best westerns I've stayed at- fabulous breakfast, clean, quiet, mostly friendly staff. The front desk clerk could use a lesson on customer service- she didnt smile once and it seemed like I was bothering her when I needed to check in. "Great hotel to stay in in Porterville, CA"
We have been coming to this hotel since 2009 for business trips and pleasure trips to visit friends residing in convalescent facilities and have always had a pleasurable hotel experience. My husband is crippled, so hotel has aleays accoodated his needs. The breakfasts at Porterville Best Western have always given a variety of breakfast choices-my husband being diabetic has to have sugar free syrup with his waffles. Some hotel breakfasts do not provide this item. Very good for the area and price. The people were very friendly and attentive. The food was alright, nothing special for the price of the room. The rooms were upgraded except for certain things like the heating and air could have used some help. Overall experience was alright. I was very pleased with my stay and the hotel accommodations were good. I enjoyed my one night stay and would stay at this location again and would recommend. The complimentary breakfast was very good. We stay one or twice a year at the Porterville location. Always Pleasant and Clean. Was rtaining as we left and staff were helpful in loading our vehicle under cover. Breakfast was excellent and no need to go to the Denny's next door. Best Westerns waffles, mini omellete and gravy were great. "Back to my home away from home"
We had a wonderful stay, the rooms were clean and well stocked.The front desk staff was friendly and it was a quick check in and out.Breakfast was good but we didnt like that the attendant was just standing there by the door watching us it made us feel a little uncomfortable.It was easy and close to get to the Hotel from our relatives house which was good because we were really tired. The only complaint is the bathroom exahuast air fan didnt wrk. Overall it was a great stay. "Porterville, CA, Best Western is Outstanding"
The only hotel I choose to stay when doing business in Porterville, CA is the Best Western. Their Staff is the BEST-porfessional, welcoming, accommodating, flexible, and fun. Room is always ready and up to professional standards. Would never stay at any other brand. "Kept us up all night!" Heater made a loud grinding sound everytime it came on. Sounded like a construction site everytime. Could not turn it off because the room gets cold fast. Not fun when you have a 2 year old. Only stayed for a night so no use switching rooms. Staff was friendly, however when we told them them of our frustration upon check-out they just simply acknowledged. I also found a clothes needle on the floor, luckily nobody had stepped on it. I am not one to complain or write reviews. But we feel like our stay there was not worth the it. Very nice staff and hotel was very clean for being older. Very convenient to have hairstylist and nail salon on premise but I did not use them as their services were not marketed. I just happened to walk by. The Internet has been out for two days. They have a framed sign up saying "techs are working on it!" but I question how long the sign as been up. I'm a business traveler and now I have to go to Starbucks to use my laptop. My key cards have stopped working twice. Breakfast eggs were cold. AC unit loudly kicks on and off every 5 minutes. The room has had some remodeling. Bathroom looks new. Everywhere else is sold out so I'll be another night. The room isn't disgusting but I've seen better in the same price range. "Porterville, CA- Best Western is Excellent"
This hotel is terrible! The main reason being that I was able to unlock the "security latch" from the outside with ease. And the staff all look like they hate their job. My grandmother left her watch in the bathroom and 15mins after checking out I went back to grab it for her and the housekeeper was already cleaning the room when I got there. She claimed not to see the watch when my grandmother knew exactly where she set it down before washing her hands. It was a very expensive watch and I know that girl stole it. It goes without saying that my family and I will never stay here or any other Best Western again! "Great stay at a great price!" We stayed here on Sunday night during Labor Day weekend. We found the place was easy to get to from the freeway, it was very clean and comfortable. There were so many people staying there that I was amazed how quiet our room was at night. There was even a soccer team having breakfast when we were there.. If I had not seen so many people at the breakfast room I would not have believed it. BTW, we did not know our room came with breakfast at the time of booking so, for us that was a great deal. I am talking a complete breakfast that included fresh waffles, eggs, sausages, breads, muffins, coffee, juice, etc. There was only one lady managing the dinning room and she did a great job. Our room was big with a comfortable king size bed, small microwave and dorm size fridge. The bathroom was a pretty good size with a great shower. I must also mention the lady in the front desk was very helpful on Monday morning when we were trying to figure out different sightseeing options. This hotel has a swimming pool and spa but we did not use them. It also has free wifi but we did not use. I also saw a computer in the lobby. Definitely staying at this location next time we go back up to that area. "Very Nice Place To Stay At Gateway to Sequoias"
I have clients in the area and always stay here. Since I have stayed her so often, the staff call me by name. They are very nice and attentive and are always helpful. Since building does not have an elevator, I always request a room on the ground floor and they are very accommodating. The location is very close to the Sequoia National Park and there is a nice casino in the mountains close by. The area around the hotel is not the best but the hotel itself was nice. Our room was very spacious and the restroom was big enough for me to get ready and my fiancé as well. The staff was nice and their breakfast was awesome so delicious. One thing to note is that the pool and hot tub are always packed and there's no elevator in the hotel do make sure to ask for a room on the first floor.